Tres Ríos is the newest Mexican kitchen and tequila bar in South Side, Pittsburgh located at 1919 East Carson Street. Tres Ríos celebrates “diversity, creativity, and uniqueness” by blending two iconic cultures together, offering a combination of Mexican cuisine and spirits and sentimental pieces of Pittsburgh history. The atmosphere provided sensations of Pittsburgh, through steel work and Warhol inspired art, and Mexico, through a variety of warm and spicy smells in the air. The table, while decorative and coexisting nicely with the overall theme, wasn’t particularly large. The size made it difficult to orient dishes around the table, but wait staff carried away used plates and platters swiftly, once it was clear they were finished with. Crab cakes and 3|R Nachos started the meal off with a bang. 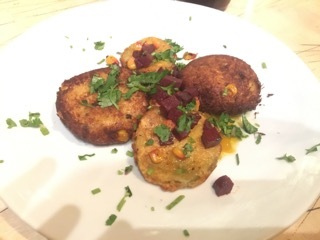 The mouthwatering crab cakes paired with the crisp fried green tomatoes warmed the tongue and prepared it for the fiesta of flavors that would follow. Toppings of tangy orange marmalade, sweet corn, and savory beet relish flirted with nearly every color and flavor a person could experience without becoming overwhelmed. 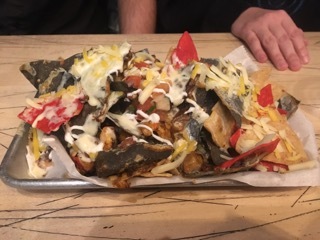 Nachos topped with cheese sauce, shredded cheese, lamb, chicken, pork belly, Pico de gallo and sour cream were messy, like nachos should be, but were washed out with different shades of brown. The nachos did, however, remained crunchy even after being buried in cheeses and juicy meats. When the Carne Asada Fajita was being served, it was impossible to tell whether it was the sizzling sound or the smell that reached the table first. The steak, tender and juicy, was well seasoned with a smoky, spicy kick. The peppers and onions were cooked, but still crunchy and not limp. Nothing on that plate lacked flavor by itself, and once wrapped together in a fresh, handmade tortilla shell all of the flavors complemented each other nicely, no one item overpowering another. 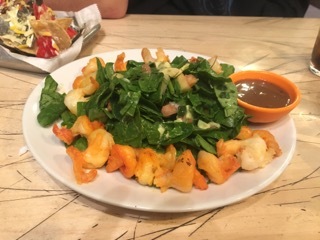 Shrimp, tossed with mango, avocado and pineapple on a bed of spinach, sprinkled with toasted pumpkin seeds, and drizzled with a Chile balsamic dressing was a new and unique experience. Shrimp prepared to perfection, the grill left behind sear marks on the sides, and juices popped out with every bite. The spinach was fresh and crisp, not soggy in the slightest, and the bitterness of the leaves didn’t draw away from the other flavors for even a second. It was surprising how well the zesty dressing paired with the sweet-and-sour fruits atop the dish. To make sure there was absolutely no possible space left for food, or air, at the end of the night, the meal was topped off with fried ice cream. One order was enough for each of the four people at the table to get a healthy helping of that creamy, crispy goodness. Balls of vanilla ice cream were deep frozen, rolled in cereal, deep fried, placed on top of crunch tortilla triangles, and drizzled with chocolate, strawberry, and caramel sauces, and finished off with swirls of whipped topping. The ice cream and toppings were enjoyable eaten with a plain old spoon, but offered a more delicious and textured taste when scooped up with the fried tortillas and eaten like a dip. This dish was certainly one meant for those with the sweetest of sweet-teeth, and would be difficult for anyone else who embarked on this sugary endeavor to complete, but that just made it all the more satisfying to have finished. In terms of sustainability, Tres Rios sources their produce through Sirna and Sons, a company that supports the Local Food Movement, a subset of the larger sustainability movement. Sirna and Sons believes that local sourcing, while beneficial to the environment, also provides enrichment for the local economy. Locally sourced produce also allows for the freshest and most flavorful fruits and vegetables. Through complete lists of produce inventory, produce seasonality charts, and deliveries six days a week depending on the needs of their restaurants, the company guarantees fresh and delicious foods. Sirna and Sons are a member of the Produce Marketing Association, a company which, among other things, offers expert, in house sustainability advisement. Sirna and Sons also partners with many local farms, listed on their website, including Carlton Farm in Ohio. Carlton Farm grows most of their own seasonal produce, and whatever they can’t grow themselves, they source from within 20 miles of their own operations, further strengthening the Local Food Movement. Overall, the atmosphere was unique, the service was prompt, and the food was impeccable, but Tres Rios may not be the place for a casual night out on the town. With two appetizes, four entrées, and one dessert to share, the total cost came out to just over one-hundred dollars for just four people, not including the tip. The quality and quantity of the meal alone was well worth the money, but at that price, it’s unrealistic to think that this is an establishment that would be visited frequently by any average college student. This entry was posted in Columns, Green Eats and tagged Destiny Reber, Food Reviews, Green Eats, Tres Ríos. Bookmark the permalink. ← Should The World Flatter A Maniac?